As most regular readers here know, I am gearing up for Booktopia 2018 (still time to register!) and have been feverishly reading through the Booktopia book list, in preparation for meeting (and hanging out with) the authors next week. 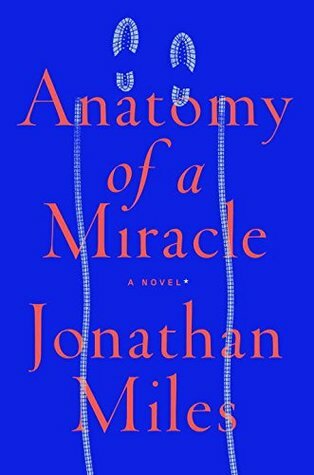 My latest read was Anatomy of a Miracle by Jonathan Miles, a novel pretending to be an investigative report. Cameron and his older sister, Tanya, have had a rough life. Their father left, their mother died when they were teens, Hurricane Katrina demolished their home, and then Cameron became paralyzed during a bombing in Afghanistan while he was in the Army. Now, four years after the event that sent him home, Cameron and Tanya live a quiet, limited existence in their small house in Biloxi, MS...until the day that Tanya pushes Cameron to the local store, the Biz-E-Bee, for beer and cigarettes, and while waiting outside, Cameron just stands up from his wheelchair and walks. His doctor at the VA can't explain this stunning change, but the local church - and believers from all over - are convinced it's a true miracle. Cameron and Tanya's quiet life explodes into one of fame, including a Vatican investigation, a reality TV show called Miracle Man, and for Cameron, the constant pressure of people asking him to pray for them or wanting to touch him. It's a lot for one young Mississippi man to handle, and Cameron is confused by the religious aspects. He wants to know for sure whether this was a real miracle or there is a medical explanation, but that is an impossible question to answer. This unique story is written from the perspective of a journalist, reporting on all that happened after the fact. Its subtitle is The True * Story of a Paralyzed Veteran, a Mississippi Convenience Store, a Vatican Investigation, and the Spectacular Perils of Grace (*a novel), so that gives you some idea of the set-up. It's a fascinating and convoluted story, and Cameron is a complex, reluctant hero. As the story progresses, and especially through the Vatican investigation, details of Cameron's past come to light, including his high school years, why he entered the Army after school, and his experiences in Afghanistan, gradually providing answers to the reader. I enjoyed this novel and was intrigued by Cameron and Tanya, though some of the war scenes were slower-going for me (though important). A thread of humor throughout helps to ease the tension. This original novel is really an in-depth and thoughtful look at what it means to be human and to live in our crazy modern world. Disclosure: I borrowed this book from the library. My review is my own opinion. Or order Anatomy of a Miracle (currently on sale) from Book Depository, with free shipping worldwide. This sounds so interesting and believable, that's probably why it works as a novel posing as an investigation. Have a wonderful time at Booktopia; I can't wait to hear your stories.